The announcement did not make it on to the front page of the newspaper, but it should have. The final woolen mill in Pittsfield was closing. It was the longest continuous running woolen mill operation in a city which had once boasted 11 textile mills, leading a county which produced more wool than any other in the country. It was October 26, 1963, when it was known as Wyandotte Mill. Over 100 workers walked and drove across the small bridges over the uppermost reaches of the Housatonic River that had once powered its predecessor, Pontoosuc Woolen Mill. It was not quite 140 years since that mill had been built, on the site of Keeler’s saw mill. 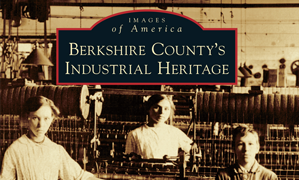 The story of Pontoosuc Woolen Mill tells the story of the county. It was the brainchild of Henry Shaw, the representative for the county in the U.S. Congress who hailed from Lanesborough. In politics that sounds more like our current Congress, Shaw had helped Henry Clay pass the Tariff of 1824, which placed large taxes on imported wool from England, thereby opening up a market for domestic wool. Shaw moved quickly on such an opportunity and brought together a group of investors to finance the purchase of the property and the construction of the original mill building, which is still standing today. Pontoosuc was not the first mill in the county, but the site it was built on housed a workshop of Arthur Scholfield, a recent immigrant from England who snuck out of his home country with models of and experience in the new machinery of spinning wool. The English were desperate to prevent the loss of this know-how and hold on to their manufacturing advantage, but had already lost cotton processing technology through another emigrant, Samuel Slater, who helped build the first mills in the country in Rhode Island and Massachusetts. Scholfield, who left England in 1793, moved north along the Housatonic, through Connecticut, and ended up in Pittsfield in 1800. Here, he built the first machine to card wool, a process of cleaning and preparing the cut wool. Since his machinery could complete the process several times faster than hand carding, he initially had a small operation to sell the cleaned wool to private individuals, spinning and weaving out of their homes. Scholfield then left woolen manufacturing and set up a small operation to build the machines to process wool, selling his equipment around the region. His special tooth-cutting machine was installed in the attic of Keeler’s saw mill at the southern tip of Pontoosuc Lake. 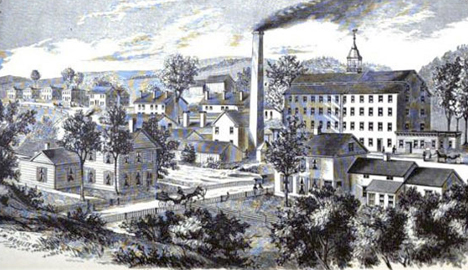 Scholfield’s inventions and the new protective tariff combined with the introduction of a new brand of sheep from Spain – merino – and the beginnings of an immigrant work force to bring all the variables together for the flourishing of industry which saw Pittsfield start the transition from an agricultural society to a center of manufacturing. Pontoosuc Woolen Mill initially employed 100 workers, a little less than half of whom were women and children. By mid-century, the mill had built a store, homes, townhouses and boarding houses for a growing workforce which would reach 500 employees by the 20th century. The list of owners and managers over the course of the 19th century reads like a Who’s Who of Pittsfield. Besides Shaw, whose son took the pen name of Josh Billings and avoided the wool business for humor, names like Clapp and Kellogg, Campbell, Frances and Plunkett still grace the city’s streets, parks and schools. These individuals helped move the city forward on a path of progress which included setting up the first fire company (owing to the risk of fire in the mills,) and the first trolley (which ran from the city center to, you guessed it, Pontoosuc Lake.) Pittsfield’s first telephone call was place at Pontoosuc Woolen Mill, to a bank on North Street. The mill filled the huge demand for kilt-like balmoral skirts and carriage blankets. When cotton became scarce during the Civil War, the demand for woolen textiles increased, creating enough demand for yet another woolen mill which opened in Pittsfield in 1863. Following the war, cotton production returned and the first mills in the city began to close. Pontoosuc Woolen Mill was able to keep open into the 20th century with lucrative government contracts, including the manufacture of military blankets during the first world war. A Maine firm bought the mill in 1928, just after its centennial, changing the name to Wyandotte Mill. The Depression hit the wool industry hard with the closing of 4 rival mills in the 1930s. Gradually, new competition from England, caused production to start shifting south to reduce costs of labor. By the time of the second war, 100% cotton and wool textiles were replaced by synthetic fibers, further reducing demand. By the 1950s, just three mills in Pittsfield were still open. Wyandotte managed to stay afloat through production of woolen cloth which was distributed around the world as raw material for other factories to produce the finished products of clothing and blankets. Organized labor had come to Wyandotte shortly after its purchase of the mill. By the 1930s Wyandotte Pittsfield workers joined a month-long textile strike in 1934 in 20 states. It was at the end of the Depression in 1939 that the Textile Workers Union of America organized Wyandotte. Additional labor actions took place following the Depression and the war when Wyandotte workers at all three of their mills struck in 1951 over the failure to make a pay raise retroactive. A few years later, when Wyandotte re-negotiated their contract, it included a far-reaching provision for equal pay for equal work by women. A general strike took place at Wyandotte in 1954, but the weakness of unions in mid-century America can be seen in the rehiring of only 50 of the 475 workers previously employed. In 1962, workers through the TWUA had signed a new contract with a wage increase. That same year, a new management team came to Pittsfield. Both the new contract and new leadership may have been part of a last ditch attempt to keep the mill open, but they failed; by October the mill had produced its last wool. Today, the complex is home to a number of small businesses; neighboring buildings that once were stores, homes and boarding houses survive but are townhouses, a restaurant, single family homes and a homeless shelter. The canal through which ran a current of water strong enough to power the looms and machines has been diverted and covered over. Elevated walkways have been torn down, windows boarded to prevent vandals from breaking glass. What remains, though, is a brick monument, tall, solid and imposing and certain to outlive the prefabricated materials of modern box stores and warehouses and factories. It’s right there, hidden in plain sight and joined by 11 other mills across the city. This entry was posted on August 14, 2013, 7:52 pm and is filed under Berkshires, History in our surroundings, Personal memory. You can follow any responses to this entry through RSS 2.0. You can leave a response, or trackback from your own site.